Section of San Diego wall knocked down. SAN DIEGO (KGTV) - There were strong reactions from San Diego groups to President Trump's State of the Union address. The president gave San Diego a nod during his 82-minute speech to the nation on Tuesday. “San Diego used to have the most illegal border crossing in our country, in response, a strong security wall was put in place. This powerful barrier almost ended all illegal crossings,” Trump said. 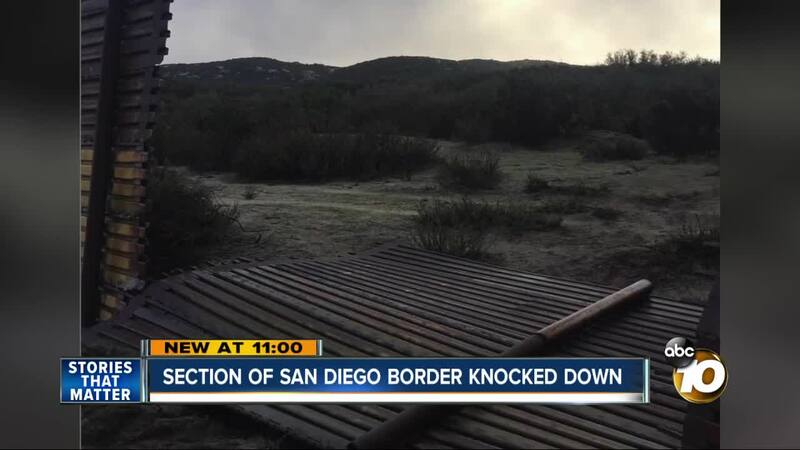 Border Patrol Chief Patrol Agent Rodney Scott posted a section of the barrier that was knocked down on his Instagram account Wednesday night. In his caption, Scott explained it appears a suspected smuggling organization is responsible, adding they found tire tracks from the downed section but couldn't find the vehicle. Scott added that it’s proof that the infrastructure is aging and needs updating. Also on Wednesday night, San Diego Border Dreamers and other immigrant advocates held a news conference to refute the president’s statements about what’s happening at the border. “It is undeniable that we live in a crisis, not a crisis made by immigrants, but a crisis made by this administration,” said Irving Hernandez, who is a dreamer. The groups say the president is using fear to perpetuate a narrative at the border that feeds a need for a wall. In his address, the president said that “walls work, walls save lives,” but Pedro Rios, with the American Friends Service Committee, said it does the opposite. Some also felt that Trump misrepresented San Diego. "San Diego is a perfect example of what happens when a barrier goes up; crime and illegal border crossings go down dramatically. Common sense dictates that all similar border areas should have that same opportunity. Anything less plays directly into the hands of human smugglers, drug traffickers, and criminals."